Purchase this product now and earn 10,250 Reward Points! Non-active ingredients in SpectrumNeeds™ include all natural flavor enhancers to encourage regular use. There are no artificial sweeteners, colors or fillers. The product is also free of gluten, casein/milk, tree nuts, peanuts, soy, egg, fish and shellfish. 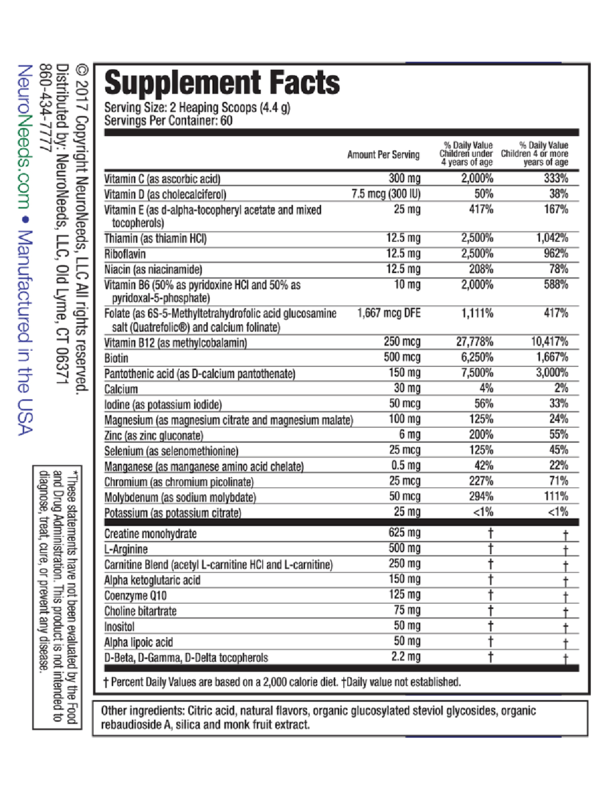 There are no ingredients at or near dosages considered to be toxic. Intended Population: SpectrumNeeds™ is designed to be used by all individuals regardless of age, gender, presence or type of neurodevelopmental conditions, common comorbidities, severity of disease, DNA sequence information, medications, or other supplements taken. 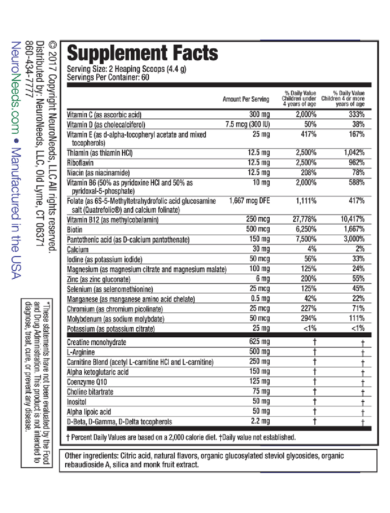 The formulation is in particular tailored to the dietary needs of children and adults on the autistic spectrum and related neurodevelopmental disorders. In particular, SpectrumNeeds™ includes many essential nutrients that are often deficient in individuals with an autistic spectrum disorder (ASD). 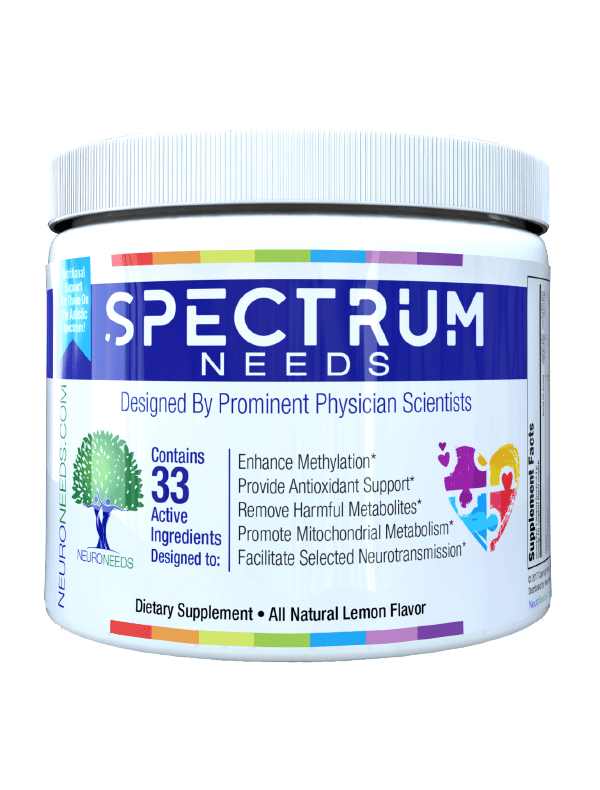 However, SpectrumNeeds™ can be taken by all individuals who desire a basis of excellent nutritional and dietary interventions to promote improved metabolism, methylation, and neurotransmission. Adults: SpectrumNeeds™ is for use by adults as well as by children. The wording of “your child” simply reflects the fact that in most cases with neurodevelopmental disorders, it is a parent that is reading and providing this product for their child, regardless of the age that the child may be. Ask your doctor: It is generally recommended that your health care provider be aware of the usage of all dietary supplements, and SpectrumNeeds™ is not an exception. The involvement of health care providers can be of particular importance in order to discuss potential interactions with medications, other supplements, or medical conditions. 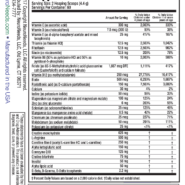 Reducing the number of supplements: SpectrumNeeds™ is designed to be safe when used in addition to the supplements that your child is already on. However, it may be possible and/or advisable to discontinue or lower the dose of one or more current supplements that your child is taking; ask your health care provider. 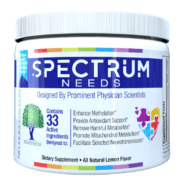 Ingredients: There are 33 active ingredients in SpectrumNeeds™, including L-arginine, coenzyme Q10, L-carnitine, acetyl L-carnitine, alpha ketoglutarate, L-creatine, alpha lipoic acid, thiamine (vitamin B1), riboflavin (B2), niacinamide (B3), D-calcium pantothenate (B5), pyridoxine (B6), pyridoxal-5-phosphate (B6), biotin (B7), calcium folinate (B9), “activated” folate (6S-5-L-methyltetrahydrofolate glucosamine, B9), methylcobalamin (B12), ascorbic acid (C), cholecalciferol (D3), d-alpha tocopheryl acetate and mixed tocopheryls (E), magnesium (citrate and malate), zinc gluconate, chromium picolinate, manganese (amino acid chelate), molybdenum (sodium molybdate), selenium (selenomethionine), potassium iodide, potassium citrate, creatine monohydrate, choline bitartrate, and inositol.